TrueNicks passed another landmark last week with the first stallions from South Africa and Chile to officially join the program. 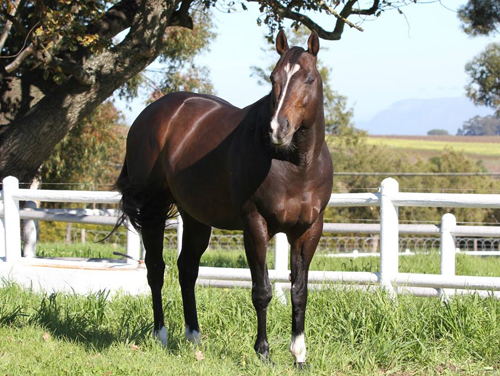 At Avontuur Estate we find two of the hottest young sires standing in South Africa in Oratorio (IRE) (TrueNicks) and Var (TrueNicks). The well-traveled duo both have U.S. and European connections. Oratorio was foaled in Ireland and is a son of Danehill, but his dam, Mahrah, is by Vaguely Noble out of Montage, an Alydar mare who comes from Alydar's own family. A three-time group winner at 2 when his victories included the Grand Criterium (Fr-I), Oratorio added the Eclipse Stakes (Eng-I) and Irish Champion Stakes (Ire-I) at 3. With his first seven crops (four Northern, three Southern), Oratorio, who kicks off his South African career in 2013, has 36 stakes winners to his name, including the 2013 Singapore Airlines International Cup (Sin-I) victor Rave (Military Attack); Biz the Nurse, successful this year in the Italian Derby (Ity-II) and Gran Premio di Milano (Ity-I); Beethoven, who took the Dewhurst Stakes (Eng-I); and other group/grade I winners Manwanui, Banchee, and Temida. Var is by Storm Cat's son Forest Wildcat out of the stakes-placed Zilzal mare Loma Preata, and is inbred to the cross of Northern Dancer over Bold Ruler (through, respectively, the three-quarters related Secretariat and Key to the Kingdom). On the racetrack, Var earned himself the title of European champion sprinter after winning the Prix de l'Abbaye de Longchamp (Fr-I). At stud, Var's been nothing short of a sensation, with 17 stakes winners to date, including the spectacular sprinting duo of Variety Club, winner of four group I events, and Val de Ra, who has a trio of group I events to her name, as well as other group I winners Via Africa, Villandry, August Rush, and Contador. Avontuur's Thoroughbred farm lies alongside the historic Avontuur Estate, a wine-producer for over 140 years, and from one wine-producing region we move to another, to greet the stallions of Haras Carioca in Chile, whose roster boasts a number of familiar names. Boboman (TrueNicks), a son of Kingmambo out of the Seattle Slew mare Slewvera, carried the Wertheimer et Frere colors to victory in the Hollywood Turf Cup (gr. IT). Buzzword (GB) (TrueNicks), a European-raced son of Pivotal out of a stakes-winning Danehill mare, won the Prix La Rochette (Fr-III) at 2 and the German Derby (Ger-I) at 3. Caesarion (IRE) (TrueNicks, a son of Danehill, was a group winner in France. His dam, Carelaine, is by Woodman out of the multiple grade I-winning Nureyev mare Annoconnor, herself a half sister to At Talaq, winner of the Grand Prix de Paris (Fr-I) in France and the Melbourne Cup (Aus-I) in Australia, and good sire in the latter country. Caesarion is a multiple group stakes sire, his offspring including group I winner Sin Respeto. Send Inthe Clowns (BRZ) (TrueNicks), bred in Brazil, is by the very successful Shirley Heights son Know Heights, and gained a group I triumph in in the Gran Premio Miguel Martinez de Hoz. Star Dabbler (TrueNicks,SRO) , who shuttles from Kentucky, is a son of Saint Ballado out of Meadow Silk, a half sister to Silken Cat, champion 2-year-old filly in Canada and dam of Speightstown. Racing in the U.S., Star Dabbler won the Indiana Derby (gr. II) and took second in the King's Bishop Stakes (gr. I). He's made a fine start in Chile, with group I winners Maria Morena and Di Giorgio, and group winners Antipodas and Hasta Nunca. Group-placed at 2 in Ireland, Tumblebrutus (TrueNicks) is a brother to none other than three-time leading sire Giant's Causeway, as well as to Freud, who has done such a stellar job in New York. Tumblebrutus is upholding the family tradition with 13 group winners, including the group I-winning Tim Bero. In Argentina at Haras Futuro, a sister farm to Haras Carioca, we find another three stallions. Leading the Parade (TrueNicks) is a stakes-placed son of A.P. Indy who is a half brother to champion 2-year-old Storm Flag Flying, and is out of champion 2-year-old filly My Flag. Passion for Gold (TrueNicks) was champion 2-year-old in France, where he scored a six-length victory in the Criterium de Saint-Cloud (Fr-I), an effort that made him winter favorite for the Epsom Derby (Eng-I). The son of Medaglia d'Oro is out of graded winner C'Est L'Amour. Shuttler Zensational (TrueNicks) needs no introduction to North Americans. The son of Unbridled's Song is the only horse ever to win three straight grade I sprints, and has his first Northern Hemisphere runners in 2013.